Do Nonprofit Board and For-Profit Boards Face Similar Major Challenges? Many nonprofits facing reductions in financial support must make heartbreaking choices between focusing on financially viable programs and dropping needed programs. Fraud is a continuing concern for nonprofit directors, both from a reputational standpoint and potential personal liabilities. Developing new competitive services and products continues to be a top priority for business concerns. Regulators and media outlets are focusing on outsized salaries for some top managers in both nonprofit and for-profit organizations, especially where nonprofit and commercial organizations are in the same field, e.g., health care. Increased governance attention to the expanded IRS form 990 and to the Intermediate Sanctions Act, covering granting illegal excess benefits, are challenges for nonprofit boards. I have noted that many volunteer directors and nonprofit executives are unaware of the latter piece of legislation. Numerous nonprofit and for-profit reports indicate both type of boards need to focus more on strategic planning. Both types of boards are wrestling with the problems of making investment decisions about emerging technologies. 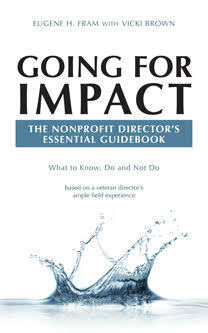 Nonprofit stakeholders, such as foundations, are expecting grantees to show impact results for their financial grants. Both types of boards are expected to respond to environmental and business sustainability concerns, whether they be forest conservation or child obesity. Conclusion: A board is a board is a board … The Major Challenges Are The Same! !